The following alert was originally posted by the Burnaby RCMP, please see that site for updates and most recent information. 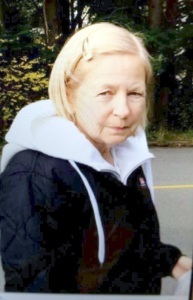 The Burnaby RCMP is seeking the public’s assistance in locating Jeanne LEMIEUX, a missing elderly female with Alzheimer’s, last seen at Walmart in Lougheed Town Centre around 1:30 pm on, December 17, 2014. LEMIEUX may have wandered off and could possibly be confused to her surroundings. LEMIEUX is described as Caucasian, 61 years old, blonde shoulder length hair, brown eyes, black coat, grey sweater, black pants and black shoes. LEMIEUX also walks with a slight limp and could walk long distances. Anyone with information as to the whereabouts of LEMIEUX is asked to contact the Burnaby RCMP.